A triangular area of Kentucky with points at Louisville, Lexington, and Northern Kentucky is often called the Golden Triangle. The name seems to fit well. At Kentucky's northern edge, just below Cincinnati, are several interesting small cities. Enjoy Covington's fine hotels and its view of the Ohio River. German heritage can be felt in its Main Strasse restored areas. A large modern aquarium was recently constructed in Newport and has become a major tourist attraction. View a variety of marine life from clear acrylic tunnels and glass floors. The city of Florence has one of the largest malls in the area. Nearby is Turfway Park, a thoroughbred racing facility, which begins its 22-day fall meet on September 6. Northern Kentucky's major airport and nearby Cincinnati Reds baseball games bring many people into the area. 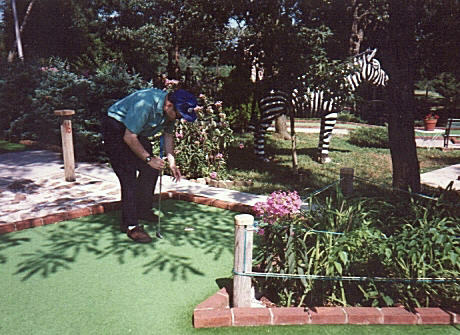 This vacationer is enjoying mini-golf at one of the courses in the Western Kentucky lake country. Bardstown is one of Kentucky's older cities. A special part of Bardstown is the Old Talbott Tavern. If you visit the area, be certain to take the opportunity to visit the outdoor theater and see a production of the Stephen Foster story. On Your Way to Kentucky . . . The trip to Kentucky can be fun as well. Not far from our Southern borders lie the beautiful Smoky Mountains and the attractions of Nashville. Entering by the Northern route, stop by Lebanon, Ohio for a train ride, museum visit, and antique shopping. To our west is the gateway arch of St. Louis, and to our east the white-water rafting and forest scenery of West Virginia and Virginia. Some links for these sites are listed below. Western Kentucky is famous for its beautiful lakes with boating, swimming, fishing, and wildlife viewing. 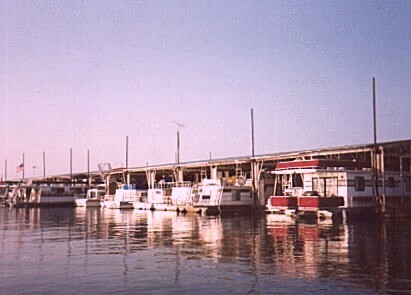 The picture at top left shows boats at the dock at The Moors Resort, one of many nice lodgings in the lake area. Mammoth Cave, believed to be the world's longest cave system, is located nearby and hosts a variety of cave tours. Minature golf and other activities are available for families. The Horse Cave Theatre presents a variety of plays. "My Old Kentucky Home" is Kentucky's state song, written by Stephen Foster. The outdoor theater in Bardstown does a marvelous play based on the life of Foster. 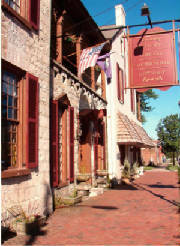 Bardstown is also a site of distillery tours, and has many historic buildings. Harrodsburg, Kentucky is the oldest settlement in the state of Kentucky, with its Fort Harrod, constructed in 1774. If you are in the area you might want to get tickets for the Legend of Daniel Boone outdoor drama, and visit the large replica of Fort Harrod with its costumed hosts and pioneer crafts demonstrations. Another interesting trip is a visit to the nearby Shaker Village of Pleasant Hill, the settlement of an early celibate religious group. The Shakers had skilled craftsmen and their very own style (Example: hanging their chairs on the wall on pegs while they swept the floor!!) One of my favorite parts of Shakertown is the dining room - delicious! I have not yet had a chance to ride the Dixie Belle Riverboat at Shaker Village but the colorful sternwheeler is on my list of things I would like to do.